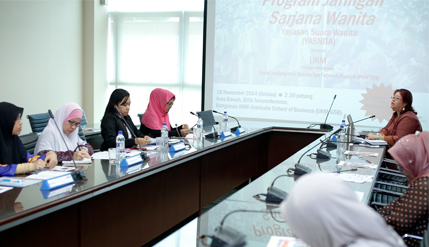 BANGI, 18 November 2014 – The rights and abilities of women are no longer taken for granted by the public just as various programmes and services had been put in place for women. Deputy Director of the Tun Fatimah Hashim Women’s Leadership Centre (PKWTFH) at The National University of Malaysia (UKM), Prof Dr Bahiyah Dato’ Abdul Hamid said women in Malaysia are no longer neglected or sidelined. She was speaking at the Women’s Masters Network Programme jointly organised by PKWTFH and the Voice of Women Foundation (YASNITA) here today. PKWTFH was established to provide knowledge application and research based on women’s leadership where one of its efforts is to build and develop the science of leadership in women through structured training and education. Dr Bahiyah said PKWTFH’s role was to provide a platform for the development of knowledge for UKM staff and community by the sharing experiences. “PKWTFH focuses on women’s leadership in education, management, business and community growth,” she said. A member of the Executive Board of YASNITA, Dr Hasnah Ismail said the organisation has an agenda for women in the work place designed to produce highly skilled, productive and responsible females. Dr Hasnah said YASNITA had designed a variety of methods, including developing various training schemes and education, loans and financial assistance to women. Another category of training called work/life balance at the work place is available for career-minded women. There is also The Women Entrepreneurs Programme specifically for budding women entrepreneurs aimed at making them more competitive.